Because so many people ask, the backsplash is a 2x5 ceramic tile with a crackle finish. it's by Walker Zanger- Mizu, bamboo. I believe now it's discontinued. I was thinking of using a light like this over the dining table, but would there be any light on the table or does it all go up? That ceiling makes the room amazing too. aimilar color of tiles.... - tiles do not show up on manuf site...anyone have suggestions of something similar? I don't think the designer is answering questions on this site. Thanks! Could you please tell me the dimensions of this island? - I am building something similar but am trying to get a sense of size - thanks! Thanks - We're currently spec'd at a square island that is 4' 6" x 4' 6" - with 42" from all cabinetry, so this gives me a general idea of how big the island might be in the room. If you don't mind me asking, was there any seating at this island or just cabinetry under? Actually, now that I look at the whole room, it's very similar to our set up. We have a squarish kitchen shape and then attached to a family/great room, but that room is 20' long for us, so we're going to have the kitchen, then an eating table, then the family room area. Even thinking about a sectional and chair like you've got in this design (we have a formal living room elsewhere.) So, it's a little different but this gives me a great perspective. Thanks! 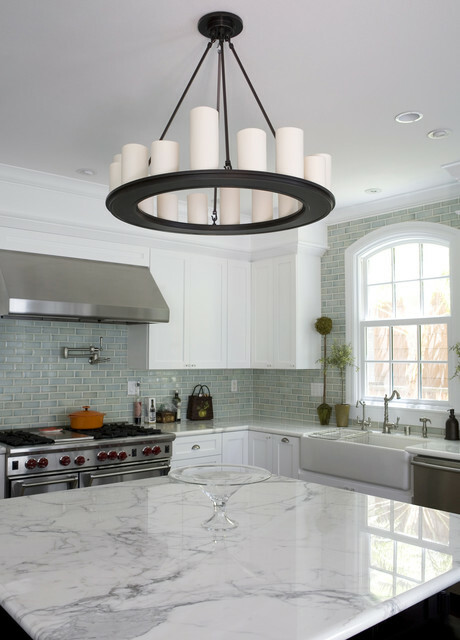 What is the color of the subway tile you used in this kitchen? Thank You. It's a 2x5 ceramic tile! It's Mizu from Walker Zanger- she posted this on main image. What is it called and where can I find this backsplash tiles? - I am redoing my kitchen and that is exactly what I want! Try Fireclay tile, located in San Jose, CA but also online. They make beautiful handmade tile and I'm sure they have a similar color —crackle glaze should also be an option with them. What is the countertop? Thank you! Your kitchen is beautiful. Are those glass subway tiles on he back splash? 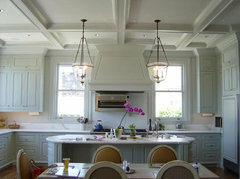 I love the crown molding above the cabinets. Who is the maker of the stove and sink and cabinetry. Beautiful! Can someone tell me the manufacturer/style of the range hood. Thanks. That looks like an 18" Wolf Pro Hood. Is it a 9 ft ceiling in the kitchen? Love the look of the soffit! Could you please give me information about the cabinets? who is the manufacturer of the kitchen sink? size? it is fabulous! What are the cabinet knobs and pulls? I love the faucet. Can you give me manufacturer's details please? What size grout line did you use for this tile? It looks great! Love the hood! Who makes it? Tile goes all the way to the ceiling. An option for the far kitchen wall. Maybe also put a porthole window thingy on the kitchen bathroom door to make it seem more nautical.